We all have special memories of moments. Some are measurable memories and others are not! Precious memories entwined within our lives make everyone their unique personality and individual! How do our memories compare from toddler to adulthood? It’s not unusual for toddlers and young children to have fears. How big does something have to be to cause fear? Those little army men or green toy soldiers that most young boys play with are less than two inches. 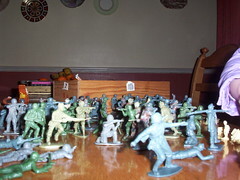 These toy soldiers came as a set with various other little figures included. As a toddler between ages of 12 and 15 months my nephew was terrified of one little Indian man! He would run and scream until we put him away. We’ve often wondered how he became so fearful of this little toy soldier, the Indian man! Was it his headdress? Was it color? Was it simply shape or form? It was a mystery! We laughed knowing the figure was harmless, but never knowing what was the fear! Neither was it of concern. Years past and upon relocating we discovered this toy soldier tucked away for safe keeping. This precious child has become a handsome young man of 18 1/2 years. 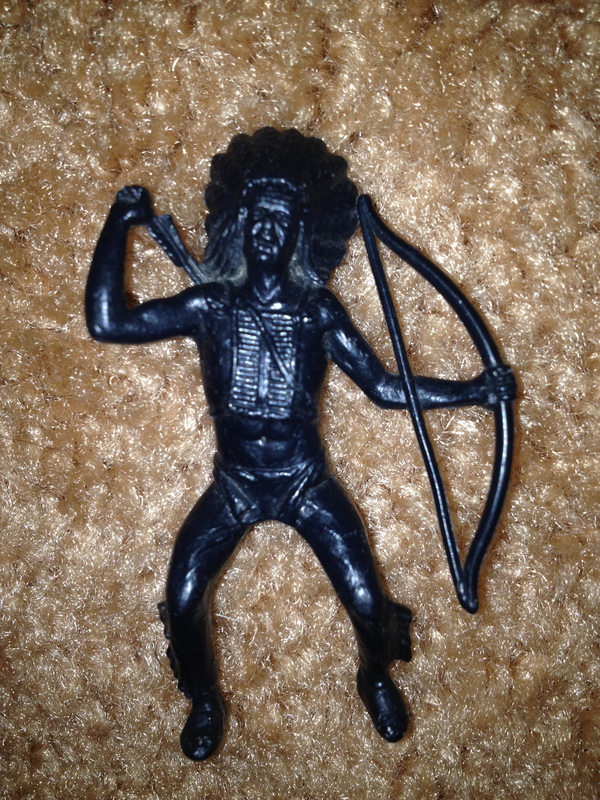 After finding the toy solider Indian man and I carried it in my purse to someday give it back to my nephew. Recently I had the opportunity to return the toy soldier Indian man to his rightful owner. Immediately he remembered the Indian figure! It was part of the toy soldiers, cowboy and Indian toy sets. He examined him carefully trying to figure out why he feared him. He remembered the little toy soldier Indian figure as being so much bigger! Maybe because our nephew was only 2 1/2 feet tall verses now over 6 foot tall? Was he really much smaller? Was he really much bigger? As he looked at the Indian man he thought maybe it was his stance or possibly the headdress. Otherwise he didn’t know why he feared the little Indian guy! It remains a mystery regarding the fear and it’s anyone’s guess. Isn’t it amazing how something so tiny can create memories of fear … fear that is long past but sweet! It’s not easy trying to figure out what goes through the minds of young children and it’s harder when these children are toddlers and can’t express their thoughts clearly. Whatever the thought was is precious! Few toddlers notice differences in such small things. He has an incredibility creative mind. Could it be that the platform that helped the Indian figure stand up was warped and toppled over knocking all toy soldiers making them fall to the ground? Was it the headdress? Was it the stance? Was it the bow and arrow? The facial expression? Was he truly larger than life to a small toddler? These are all possibilities … It’s just a simple mystery that even that young toddler that is now an adult cannot answer! It’s all about perceptions and our perceptions change with experience and time. We were blessed to share in these memories. Don’t let anyone change your perception or your memory. It’s your memory and you own it. Do you have memories of something or someone special that changed over the years? Why? Is it based on what you know or what you have heard? Anything that seems so ridiculous? I remember the first time I went to the dentist.I was probably 4 years old. I had heard about dentists drilling teeth but did not understand what that meant. As I walked into the treatment area from the waiting room, I had to walk through a room with a bed. Maybe it was for recovery for those who needed laughing gas. Anyway, as I walked through this room, I noticed some workmans’ tools on the bed, including a brace and set of bits. A brace is an old style of wood drill from drilling large holes with a cranking type of action. The drills were 1/4 inch to 1 inch and larger. I knew what a brace and bits was for because my dad had taught me how to use his set. They sat me in the treatment chair but never could get my mouth open. I would not even taste the Lavoris mouthwash. Nobody was going to drill in my mouth with that equipment. By the time I had a successful dental exam some time later, I needed 8 cavities filled. We always got Winchell’s Donuts on the way home after the dentist. Go figure.